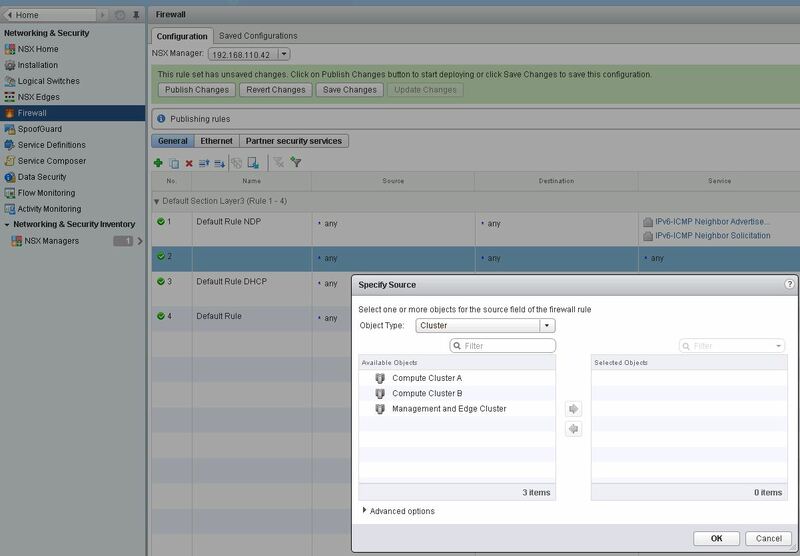 NSX Manager is tightly connected to the vCenter and with 1:1 relationship to vCenter. 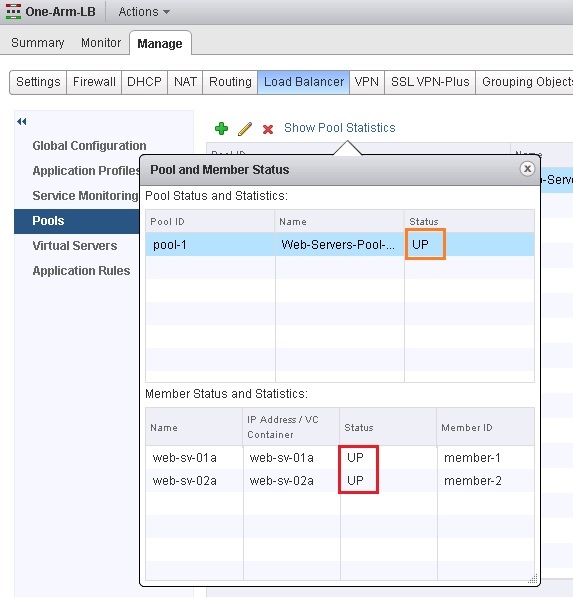 With the process of connect NSX manager to vCenter we have two different configuration steps. 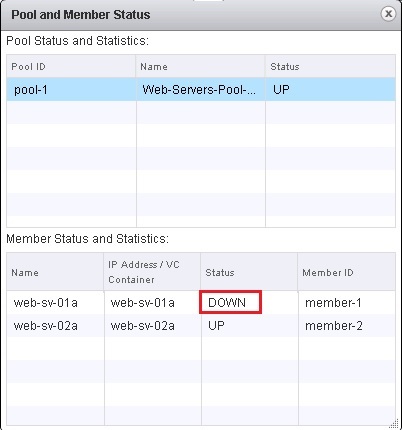 “Lookup Servers” and “vCenter Server”. 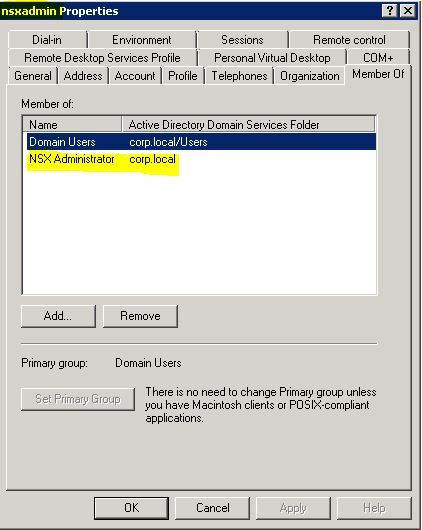 Lookup service allow group based authentication to NSX Manager, is optional configuration, without Lookup service configuration the functionality of NSX is not affected at all. This is must configuration. 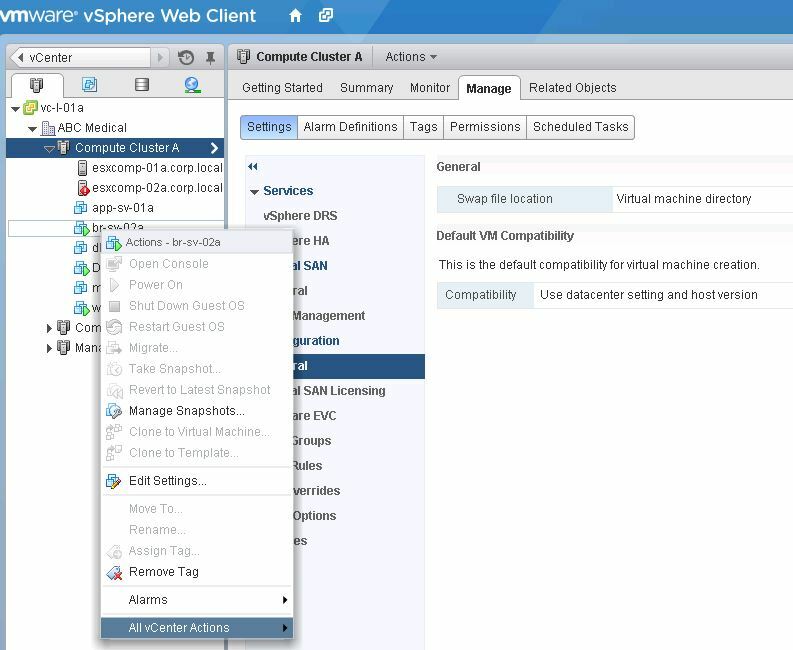 Register to vCenter injects a plugin into the vSphere Web Client for consumption within the Web management platform. 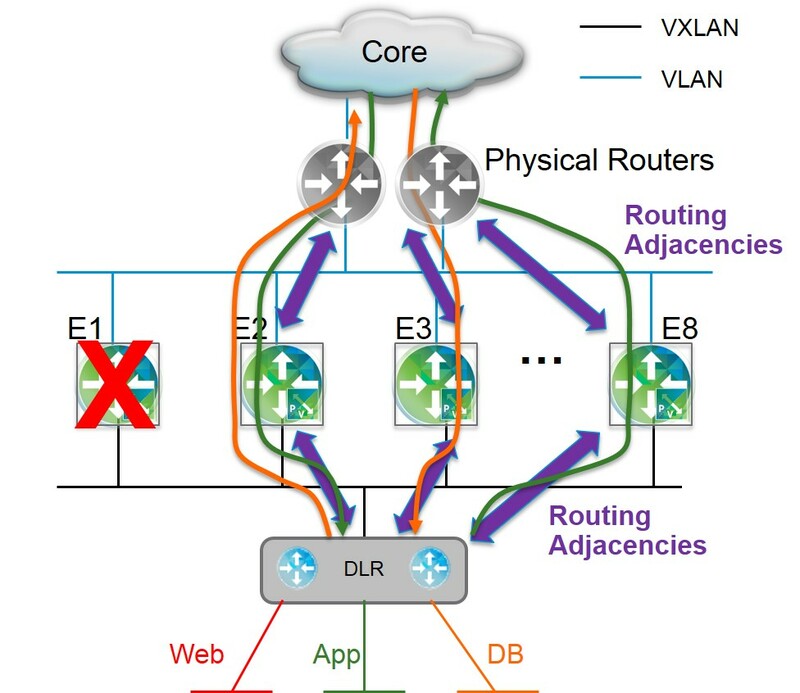 Connectivity problem between the NSX managers to vCenter. 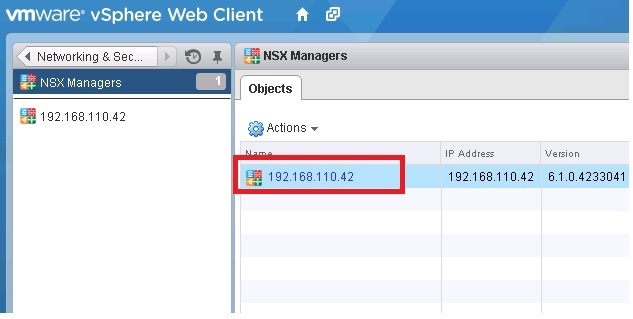 DNS not configured property on NSX Manager or vCenter. Time is not sync between NSX manager and vCenter. User used to SSO need to be with administrative rights. 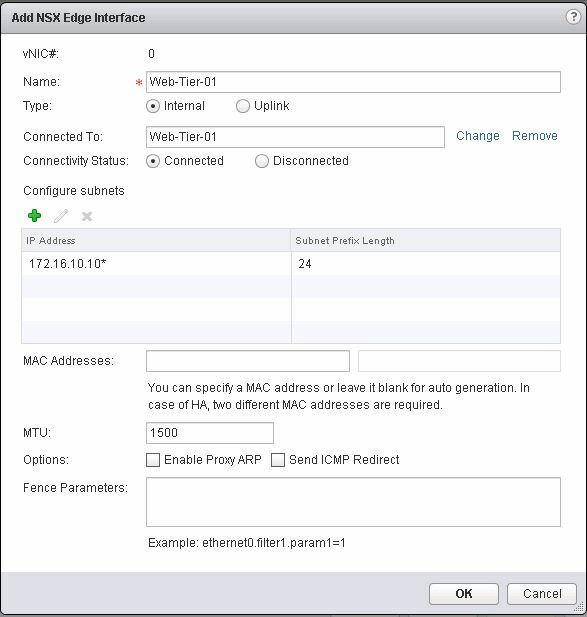 Verify connectivity from NSX manager to vCenter. 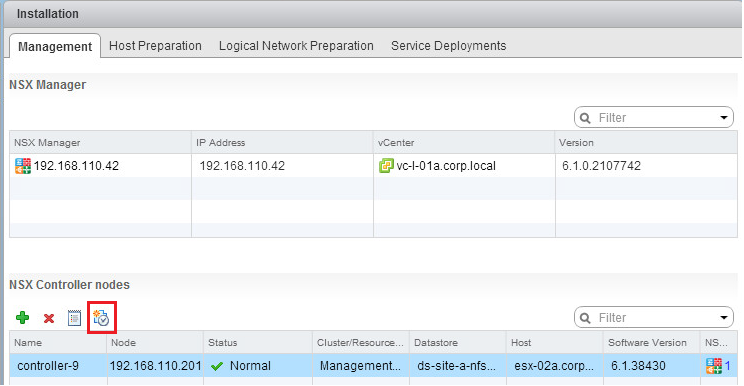 Ping from NSX manager to vCenter with ip and FQDN. 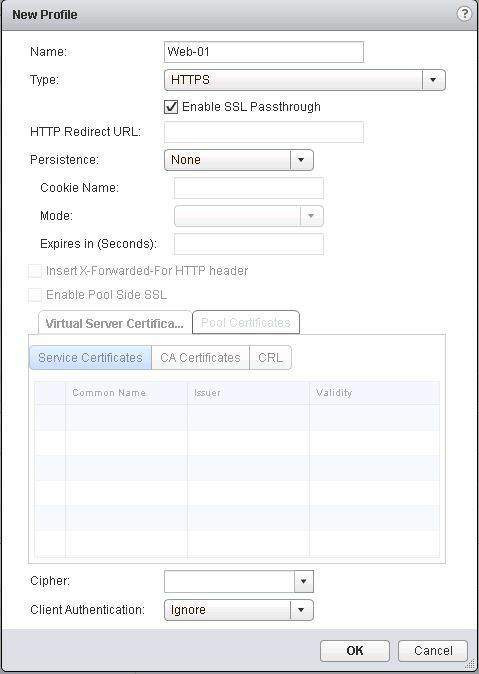 Verify DNS resolve from NSX manager to vCenter. 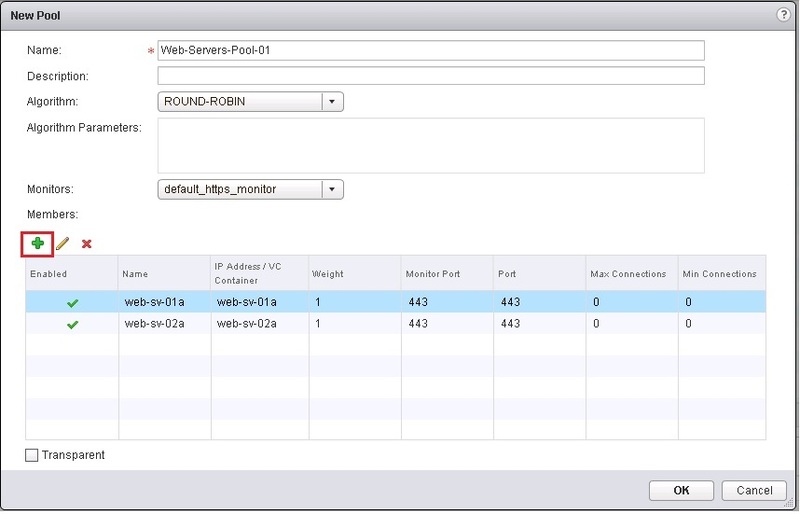 Ping from NSX manager to vCenter with FQDN. 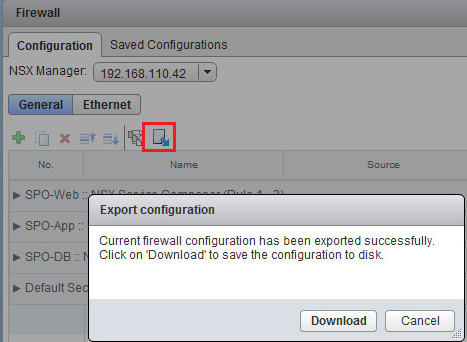 If this not work verify that you configure DNS on the NSX manager. If you have firewall between NSX Manager and vCenter, verify it allow SSL on TCP/443, also allow ping for connective checks. Verify that actual time is sync between vCenter and NSX Manage. Note: After configuration of Time settings, Appliance needs to be restarted. ter or Lookup service need to be with administrative rights. This blog was based on Kevin lecture, I add screenshots and my experience. 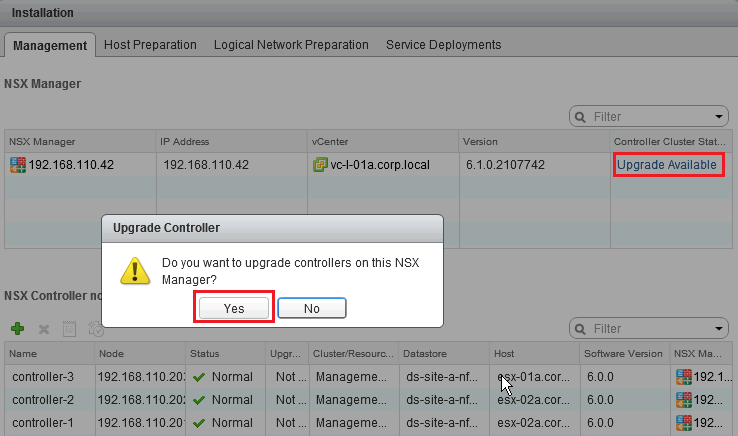 Upgrade NSX can be very easy if planned right, or very frustrating if we try to do shortcuts in the process. 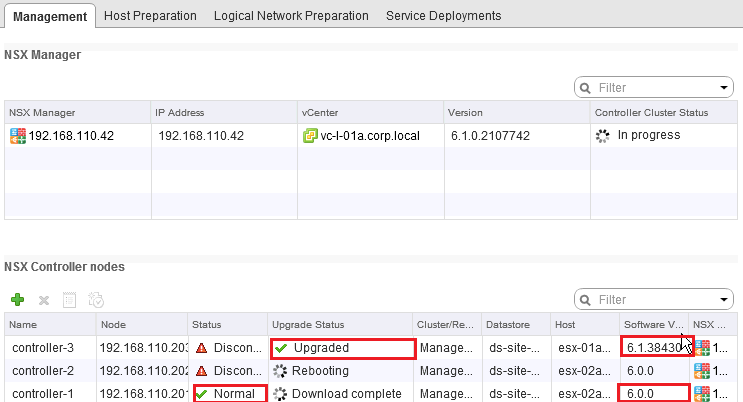 In this blog I will try to documents all the steps need for complete nsx-v upgrade. Read the NSX release notes. 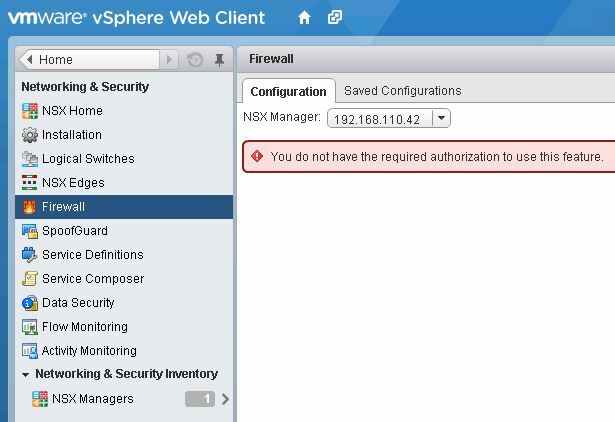 Verify the state of the NSX and vSphere infrastructure. Compare MD5 sum you get from Calculate against VMware official MD5 web site. Again this line came from filed, the scenario is you complete the upgrade process and now facing issue. How do we you know if the issue wasn’t there before we start the upgrade? Do not assume everything is working before you start to touch the infrastructure, Check it!!! 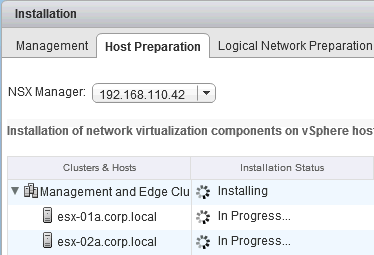 Check you have minimum 3 esxi host in etch NSX Cluster. During NSX upgrade in some situation, NSX cluster with 2 hosts or less can causes issues with DRS/Admission control/Anti-Affinity rules. 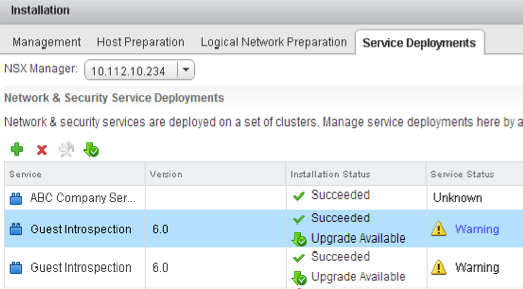 My recommendation to get success with upgrade process, try to work with 3 host in etch NSX cluster you plan to upgrade. 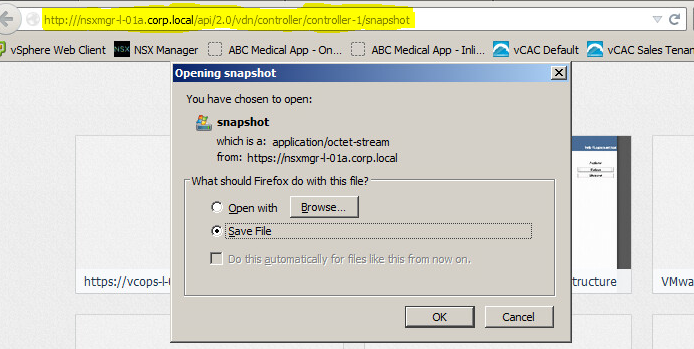 Starting from 6.0.4 we have spetial API call to take snapshot of controller. 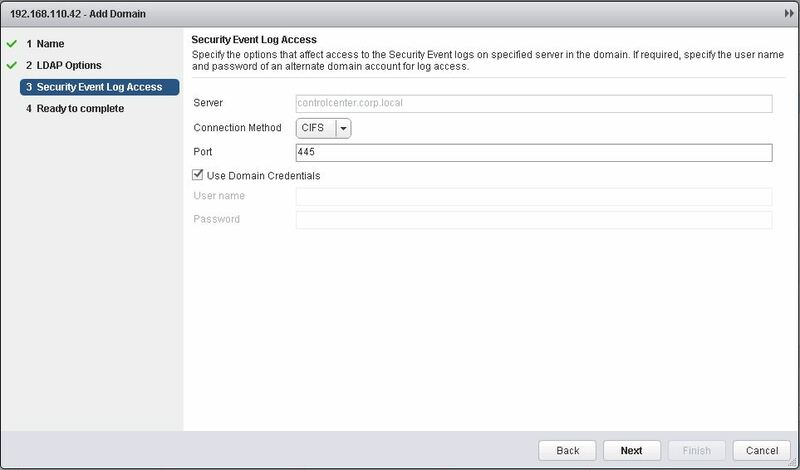 We are using user identity with distributed firewall and new user login during NSX Manager is down. During upgrade controller nodes, the upgrade file is download to etch node, the process will start to upgrade node1, then node2 and end node3. Working with enable DRS live virtual enviroment, vMotion of VM can happen, VM may change is currint esxi host location, as results may face forwading issue because of other VTEP will not reflect this update. Other issue may ocure if dynamic routing get update of topology state, for example new route add or remove. To avoid this issue we need keep routing unchange. 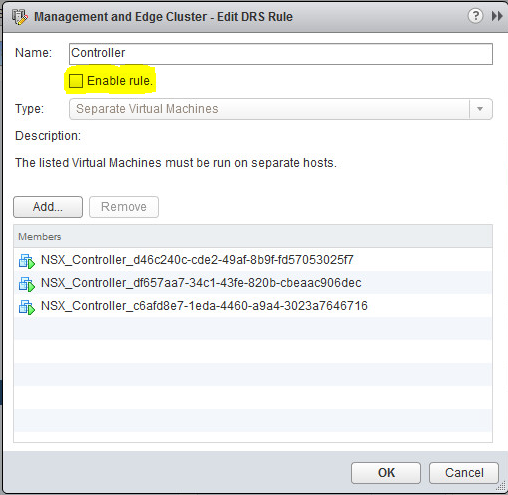 To limited the expose time window for forwading issue with worload VM’s my recommendation is the change the DRS setting to maual, this will limit the VM vMotion in NSX clusters durring controller update!! Note: After compelte controller upgrade, change it back to privios configuration. When controller node-2 complete is rebooting process, we get two controllers upgraded and on same version. At that point we gain back cluster majority, controller node-1 still need to finish his upgrade and rebooting process. When all tree controller nodes completed the rebooting the cluster is upgrade. During upgrade NSX clusters, esxi host required reboot, there will no impact on data plane for VM’s because thy will move automatically with DRS. 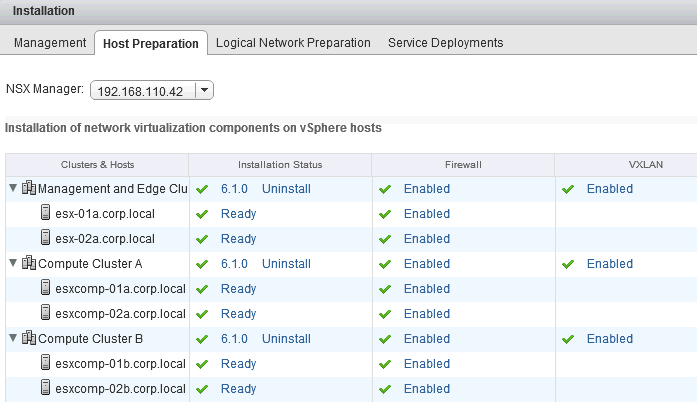 If DRS is disable, vSphere admin will need to move VM’s manually and reboot this esxi host. 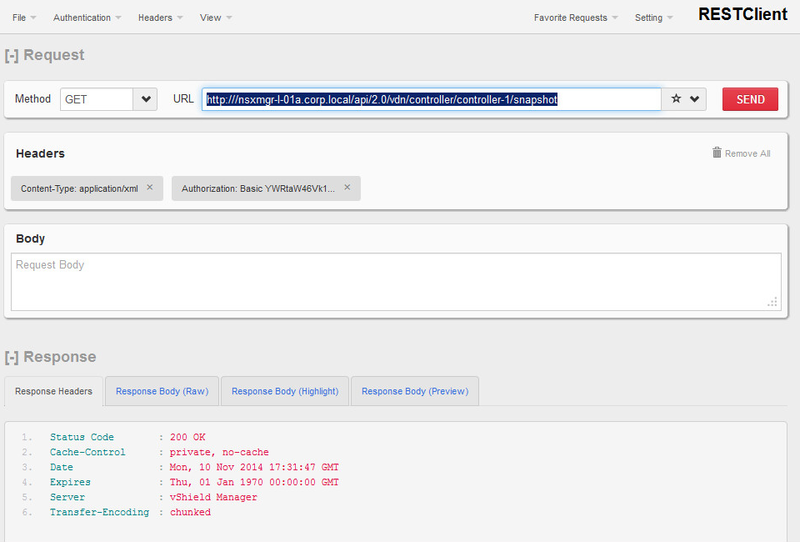 This is rezone admission control with 2 hosts may prevent automatic host upgrade. My recommendation is to avoid 2 host clusters, or manually evacuate a host and put into maintenance mode. If you have created anti-affinity rules for Controllers, 3 hosts will prevent the upgrade. Disable anti-affinity rules by uncheck “Enable rule” for automatic hosts upgrade and enable it after upgrade complete. With default anti-affinity rules for Edges/DLR, 2 hosts will prevent the upgrade. Uncheck the “Enable rule” anti-affinity rules for Edges to allow automatic hosts upgrade. Enable it after upgrade compete. Once all hosts are rebooted, the host update is completed. 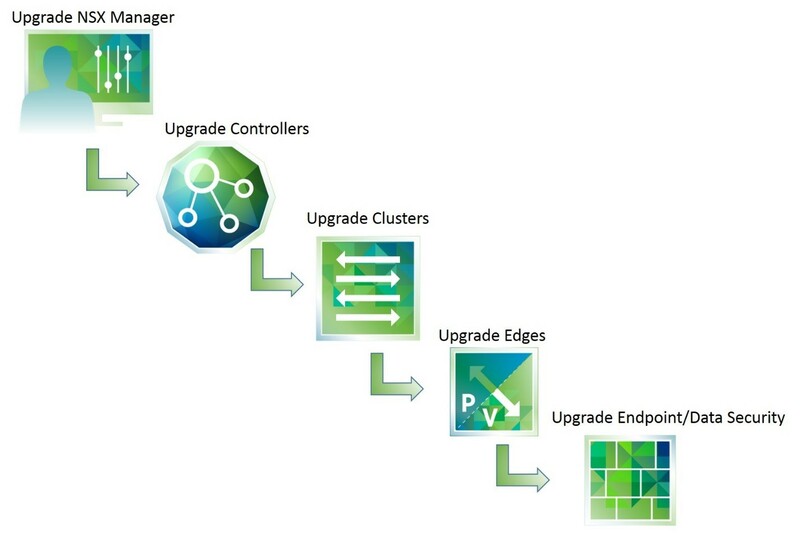 During the upgrade process new ESG VM is deployed alongside the existing one, when the new ESG is ready, old ESG vnic are disconnected and new ESG vnics connected. The New ESG send GARP. This process can affect forwarding plan, we can minims it with Edge working in ECMP mode. 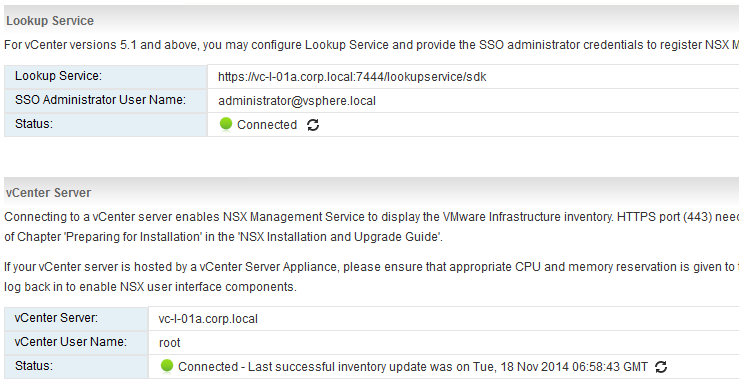 If an upgrade is available to the Guest Introspection / Data Security an upgrade link is available in the NSX UI. 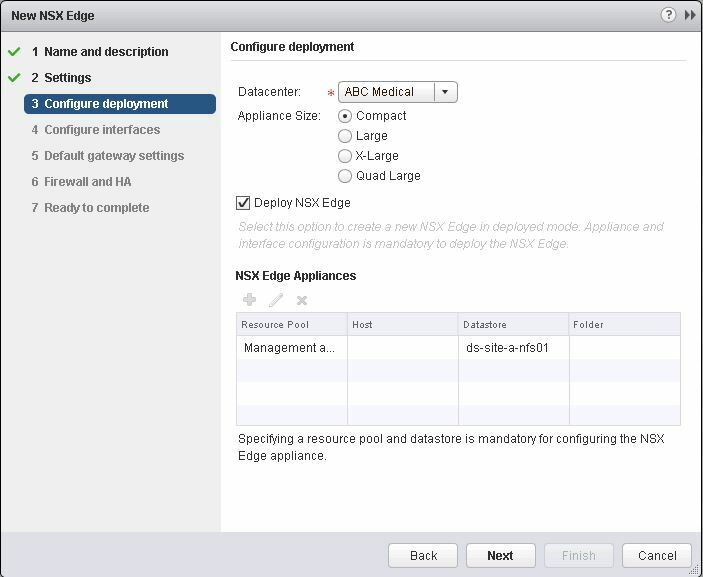 Follow NSX installation guide for specific details on upgrading Guest Introspection / Data Security. The Controller cluster in the NSX platform is the control plane component that is responsible in managing the switching and routing modules in the hypervisors. 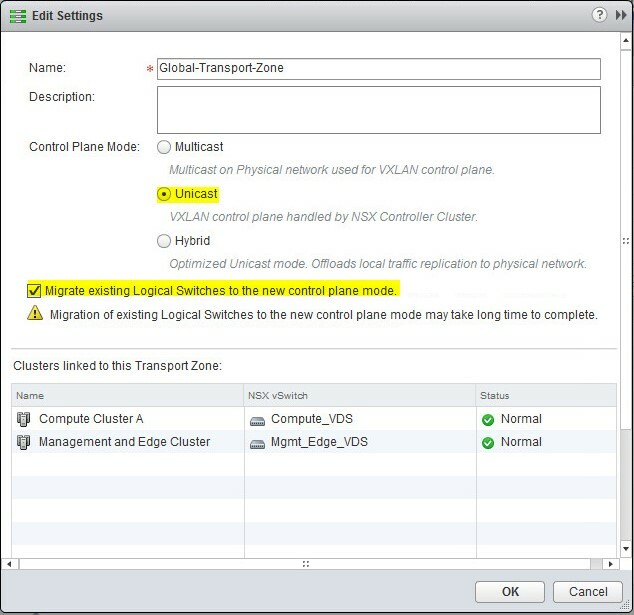 The use of controller cluster in managing VXLAN based logical switches eliminates the need for multicast. Each Controller Node is assigned a set of roles that define the type of tasks the node can implement. By default, each Controller Node is assigned all roles. API provider: Handles HTTP web service requests from external clients (NSX Manager) and initiates processing by other Controller Node tasks. 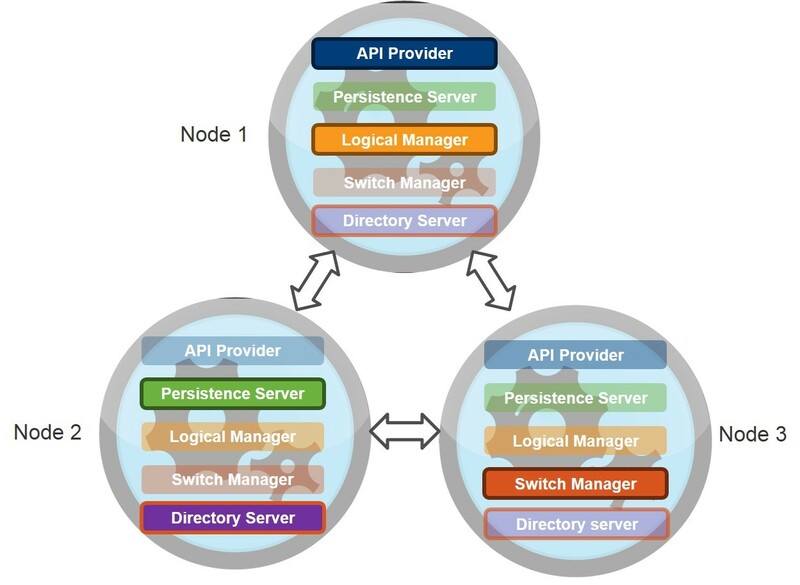 Persistence Server: Stores data from the NVP API and vDS devices that must be persisted across all Controller Nodes in case of node failures or shutdowns. 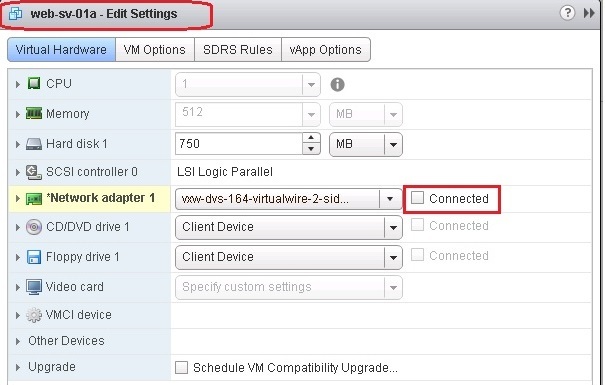 Logical manager: Monitors when endhosts arrive or leave vDS devices and configures the vDS forwarding states to implement logical connectivity and policies..
Switch manager: Maintains management connections for one or more vDS devices. Directory server: manage VXLAN and the distributed logical routing directory of information. Any multi-node HA mechanism has the potential for a “split brain” scenario in which a cluster is partitioned into two or more groups, and those groups are not able to communicate. In this scenario, each group might assume control of all tasks under the assumption that the other nodes have failed. NSX uses leader election to solve this split-brain problem. 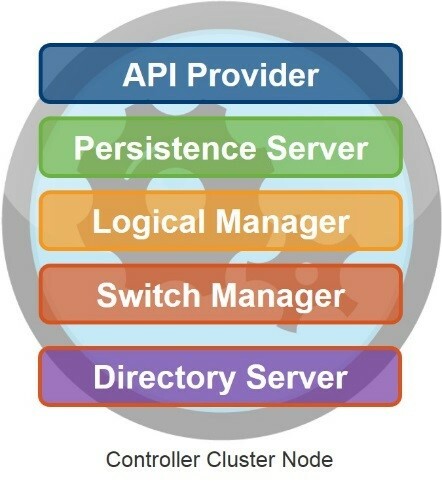 One of the Controller Nodes is elected as a leader for each role, which requires a majority vote of all active and inactive nodes in the cluster. it is not possible for two leaders to exist simultaneously within a cluster, preventing a split brain scenario. The leader election mechanism requires a majority of all cluster nodes to be functional at all times. 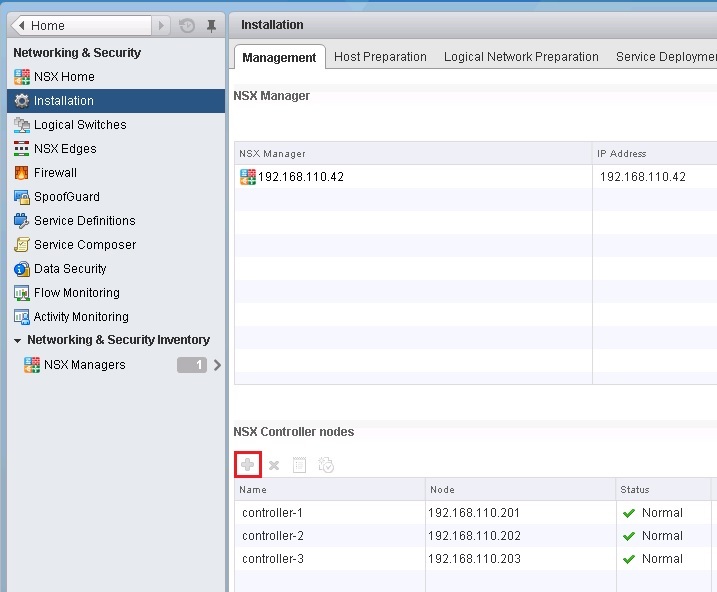 Here is example of 3 NSX Controllers and role election per Node members. Node 3 master for roles: Switch Manger. without providing any additional resiliency. This is because with 2 nodes, the majority number is 2 and that means that if one of the two nodes were to fail, or they lost communication with each other (dual-active scenario), neither of them would be able to keep functioning (accepting API calls, etc.). The same considerations apply to a deployment with 4 nodes that cannot provide more resiliency than a cluster with 3 elements (even if providing better performance). Ensure that the Controllers are installed on systems that meet the minimum requirements. The CLI command “request system compatibility-report” provides informational details that determine whether a Controller system is compatible with the Controller requirements. 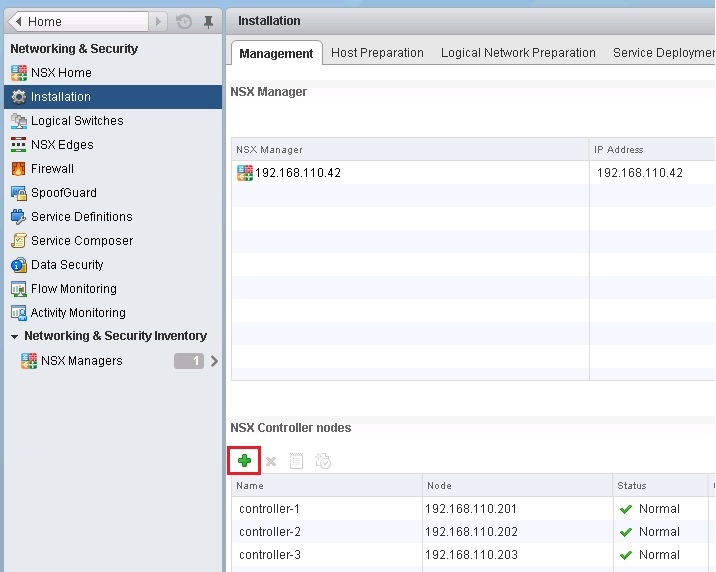 The NSX Manager continually checks whether all Controller Clusters are accessible. If a Controller Cluster is currently in disconnected status, your diagnostic efforts and log review should be focused on the time immediately after the Controller Cluster was last seen as connected. This NSX “Controller nodes status” screenshot show status between the NSX Manager to Controller and not the overall controller cluster status. So even if we have all controllers in “Normal”state like the figure below , that doesn’t mean the overall controller status is ok.
Join status: verify this node complete join to clusters process. Majority status: check if this cluster is part of the majority. 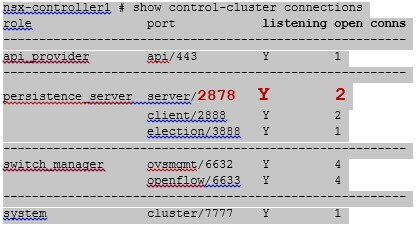 If a Controller node is a Controller Cluster majority leader, it will be listening on port 2878 (as indicated by the Y in the “listening” column). The other Controller nodes will have a dash (-) in the “listening” column. The next step is to check whether the Controller Cluster majority leader has any open connections as indicated by the number in the “open conns” column. On a properly functioning Controller, the open connections should be the same as the number of other Controller nodes in the Controller Cluster (e.g. In a three-node Controller Cluster, the Controller Cluster majority leader should show two open connections). 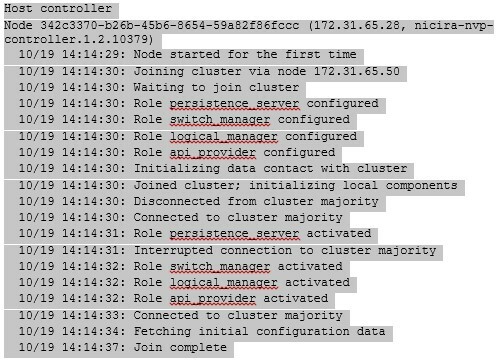 The command show control-cluster history will allow you to see a history of Controller Cluster-related events on this node including restarts, upgrades, Controller Cluster errors and loss of majority. This section covers issues that may be encountered when attempting to join a new Controller Node to an existing Controller Cluster. An explanation of why the issue occurs and instructions on how to resolve the issue are also provided. Symptom: Joining a new Controller node to a Controller Cluster may fail all of the existing Controllers are disconnected. 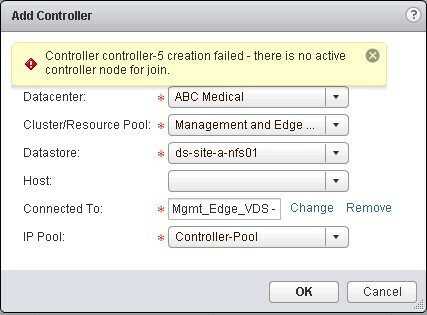 If n nodes have joined the NSX Controller Cluster, then a majority (strictly greater than 50%) of those n nodes must be alive and connected to each other, before any new data to the system. This means that if you have a Controller Cluster of 3 nodes, 2 of them must be alive and connected in order for new data to be written in NSX. 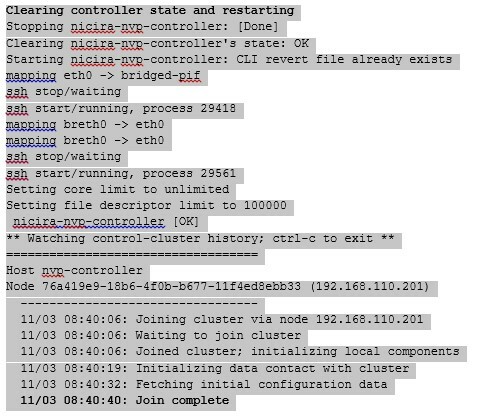 In our case to add new controller node to cluster we need at least on member of the cluster to be in “Normal” state. Resolution: Start the Disconnected Controller. If the Controller is disconnected due to a permanent failure, remove the Controller from the Controller Cluster. Symptom: the join control-cluster CLI command hangs without ever completing the join operation. The IP address passed into the join control-cluster command was incorrect, and/or does not refer to a currently live Controller node. 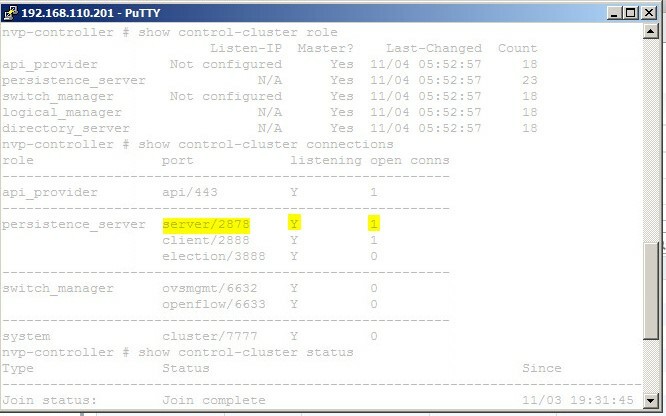 Make sure that 192.168.110.201 is part of existing controller cluster. Use the IP address of a properly configured Controller that is reachable across the network. The join control-cluster CLI command fails. Explanation: If you have a Controller configured as part of a Controller Cluster, that Controller has been disconnected from the Controller Cluster for a long period of time (perhaps it was taken offline or shut down), and during that time, the other Controllers in that Controller Cluster were removed from the Controller Cluster and formed into a new Controller Cluster, then the long-disconnected Controller will not be allowed to rejoin the Controller Cluster that it left, because that original Controller Cluster is gone. You must issue the join control-cluster command with the force option on the old Controller to force it to clear its state and join the new Controller Cluster with a fresh start. Note: The forced join command deletes previously joined node with the same IP. 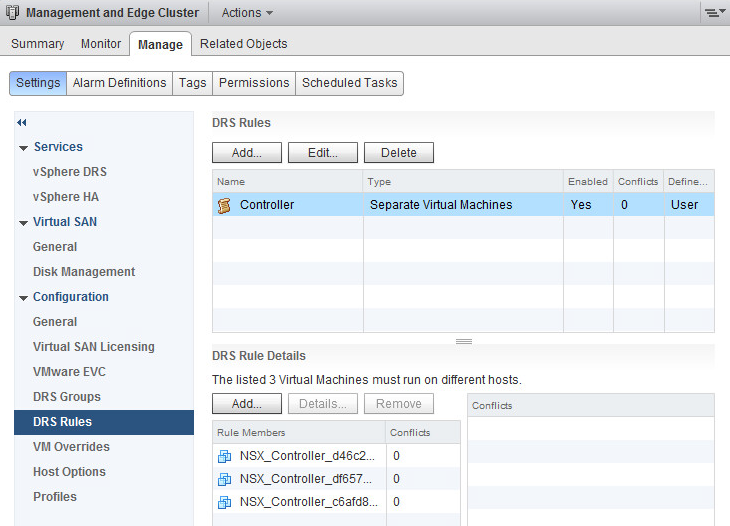 When controller cluster majority issue arises, it will very difficult to spot it from the NSX manager GUI. For example the current state of the controllers from the NSX manager point of view is that all the member are in “Normal” state. Node 3 think his alone and own all of the roles. To recover from this scenario Node 3 need to join to majority of the cluster, the ip address to join need to be to Node1 because his the leader of the majority. 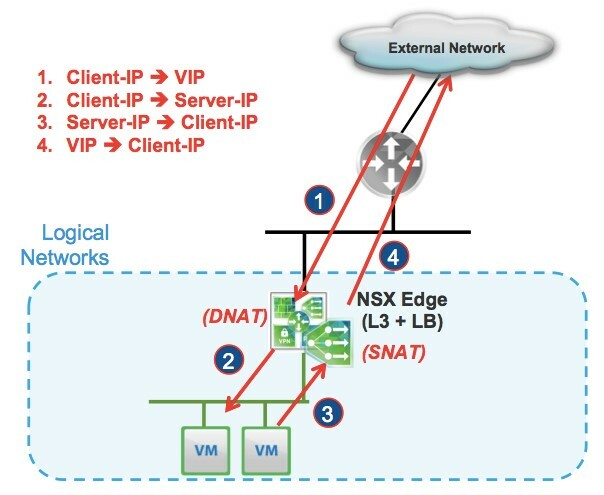 The assumption is our environment already deployed NSX Edge, DLR and we have logical switch connected to VM’s and would like to preserve it. Migrate existing logical switch to Multicast mode. Deployed 3 new NSX controllers. 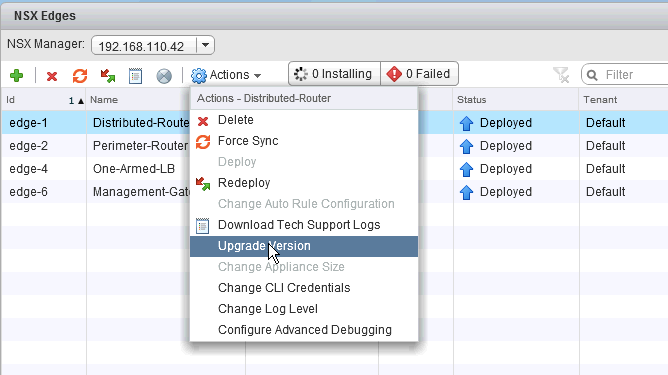 Sync the new deployed NSX controllers to unicast mode with the current state of our NSX. Even if the “join-cluster” command on a node appears to have been successful, the node might not have come up completely for a variety of reasons. The way this error tends to manifest itself most visibly is that the controller process isn’t listening on all the ports it’s supposed to be, and no API requests or switch connections are happening. You’ve set an incorrect IP as the management-address, or as the listen-ip for one of the roles (like switch_manager or api_provider). Note that if you are using DHCP for the IP addresses of your controller nodes (not recommended or supported), the IP address could have changed since the last time you configured it. to determine whether the IPs listed correspond to the IPs of the Controllers in the Controller Cluster. see if any of the partitions have 0 bytes available. The NSX CLI command show system statistics can be used to display resource utilization for disk space, disk I/O, memory, CPU and various other processes on the Controller Nodes. The command offers statistics with one-minute intervals for a window of one hour for various combinations. The show system statistics CLI command does auto-completion and can be used to view the list of metric data available. 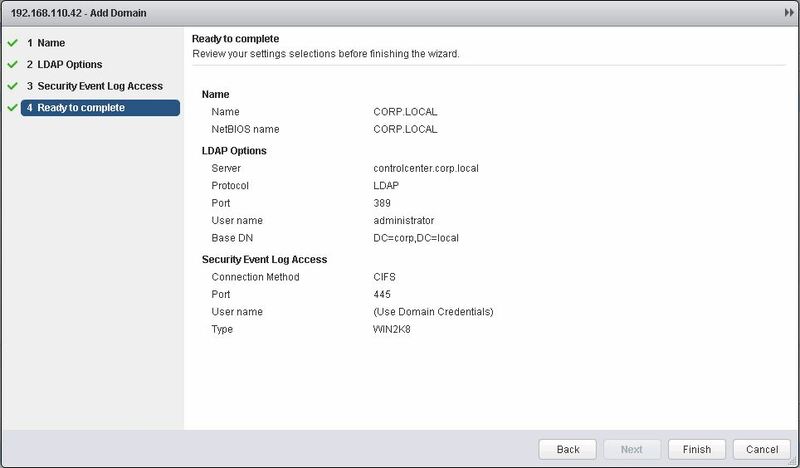 Support UDP application starting from NSX SW release 6.1. 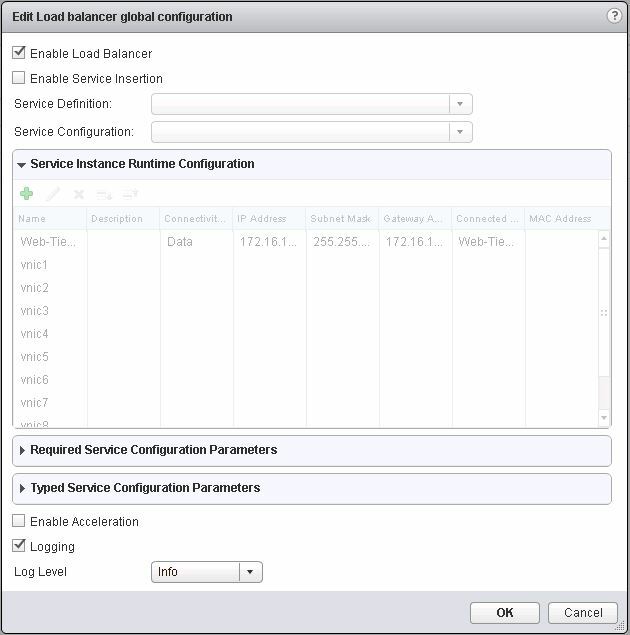 Note: the NSX platform can also integrate load-balancing services offered by 3rd party vendors. This integration is out of the scope for this paper. 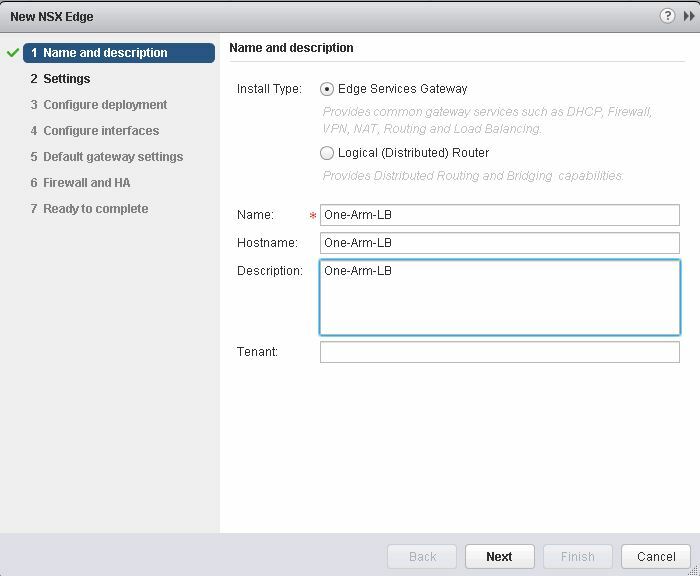 One-arm mode (called proxy mode): this scenario is highlighted in Figure below and consists in deploying an NSX Edge directly connected to the logical network it provides load-balancing services for. 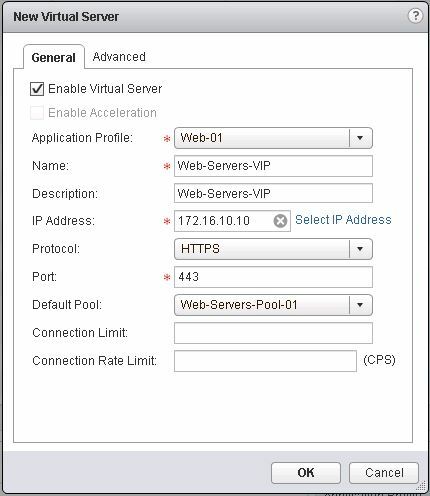 The external client sends traffic to the Virtual IP address (VIP) exposed by the load balancer. 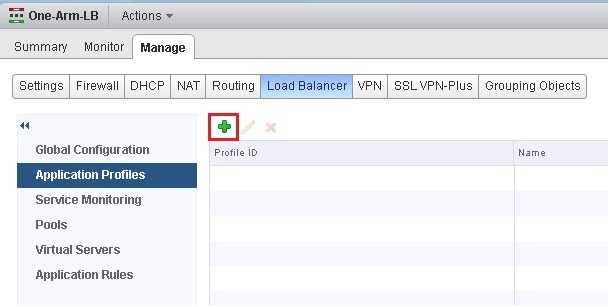 The load balancer performs two address translations on the original packets received from the client: Destination NAT (D-NAT) to replace the VIP with the IP address of one of the servers deployed in the server farm and Source NAT (S-NAT) to replace the client IP address with the IP address identifying the load-balancer itself. S-NAT is required to force through the LB the return traffic from the server farm to the client. The server in the server farm replies by sending the traffic to the LB (because of the S-NAT function previously discussed). The LB performs again a Source and Destination NAT service to send traffic to the external client leveraging its VIP as source IP address. 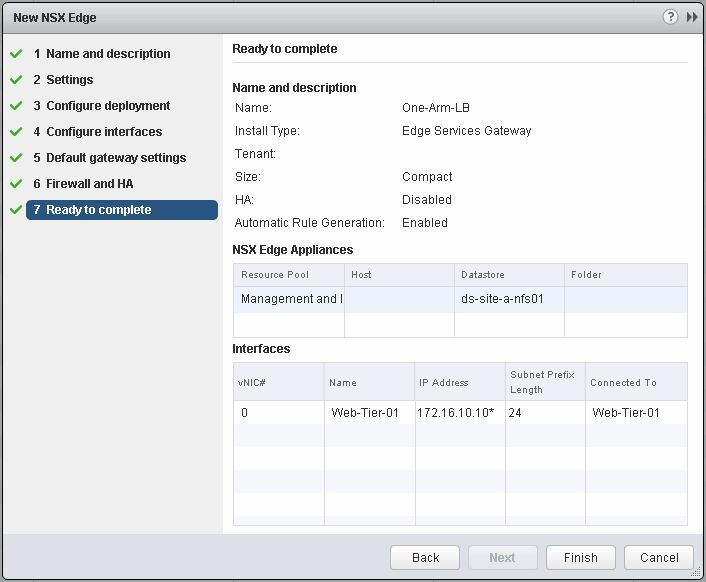 The advantage of this model is that it is simpler to deploy and flexible as it allows deploying LB services (NSX Edge appliances) directly on the logical segments where they are needed without requiring any modification on the centralized NSX Edge providing routing communication to the physical network. 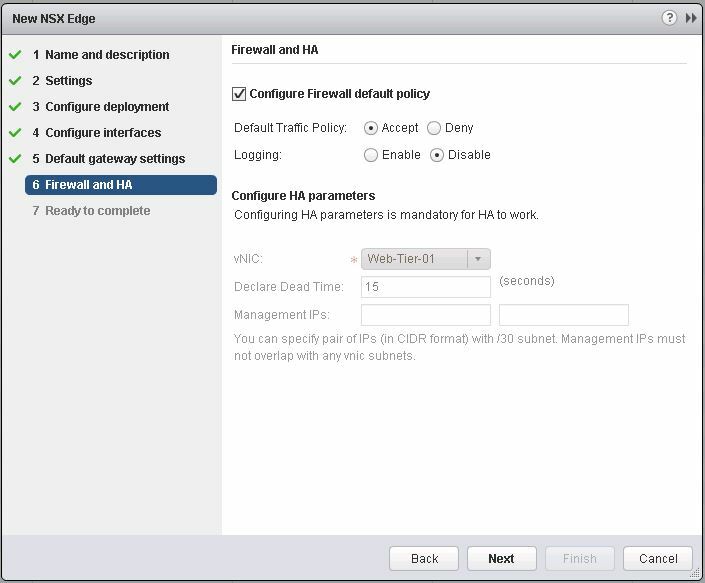 On the downside, this option requires provisioning more NSX Edge instances and mandates the deployment of Source NAT that does not allow the servers in the DC to have visibility into the original client IP address. Note: the LB can insert the original IP address of the client into the HTTP header before performing S-NAT (a function named “Insert X-Forwarded-For HTTP header”). This provides the servers visibility into the client IP address but it is obviously limited to HTTP traffic. 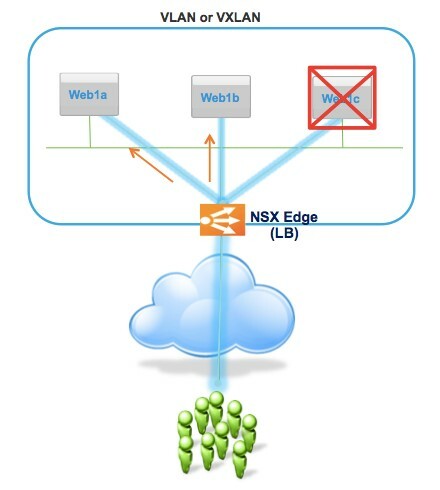 Inline mode (called transparent mode) requires instead deploying the NSX Edge inline to the traffic destined to the server farm. The way this works is shown in Figure below. 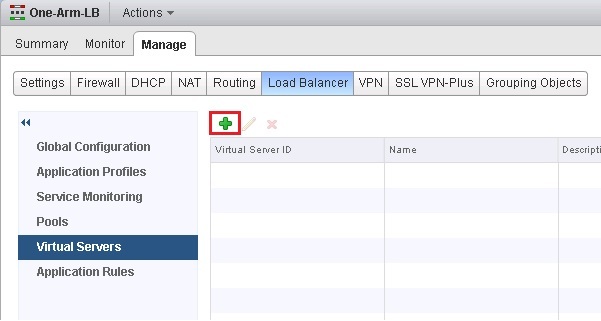 The load balancer (centralized NSX Edge) performs only Destination NAT (D-NAT) to replace the VIP with the IP address of one of the servers deployed in the server farm. The server in the server farm replies to the original client IP address and the traffic is received again by the LB since it is deployed inline (and usually as the default gateway for the server farm). The LB performs Source NAT to send traffic to the external client leveraging its VIP as source IP address. This deployment model is also quite simple and allows the servers to have full visibility into the original client IP address. At the same time, it is less flexible from a design perspective as it usually forces using the LB as default gateway for the logical segments where the server farms are deployed and this implies that only centralized (and not distributed) routing must be adopted for those segments. It is also important to notice that in this case LB is another logical service added to the NSX Edge already providing routing services between the logical and the physical networks. 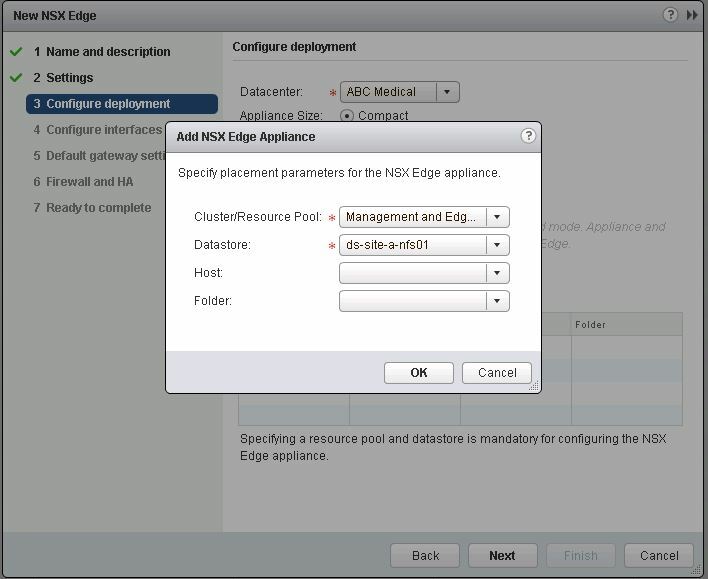 As a consequence, it is recommended to increase the form factor of the NSX Edge to X-Large before enabling load-balancing services. In below are some deployment examples of tenants with different applications and different load balancing needs. Notice how each of these applications is hosted on the same Cloud with the network services offered by NSX. Each tenant has its own load balancer. Each tenant configuration change does not impact other tenants. Load increase on one tenant load-balancer does not impact other tenants load-balancers scale. Each tenant load balancing service can scale up to the limits mentioned above. The same tenant can mix its load balancing service with other network services such as routing, firewalling, VPN. 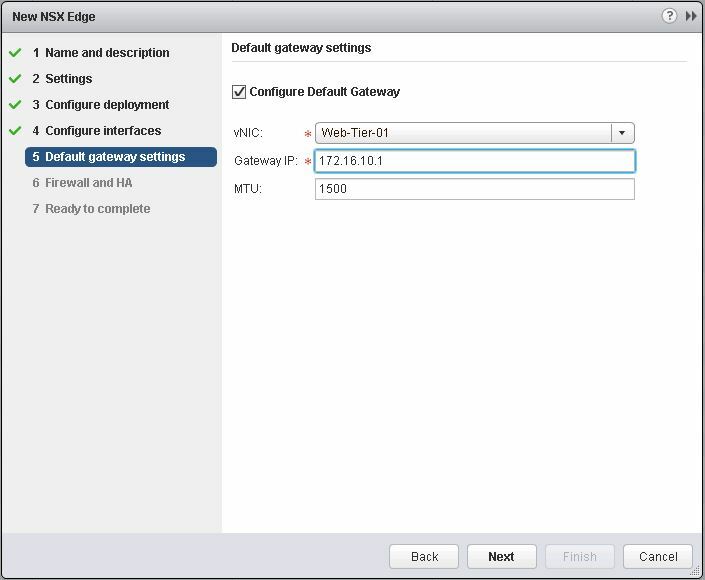 We will add to this lab NSX Edge service gateway (ESG) for load balancer function. The ESG (in red line) located at Web VXLAN 172.16.10.10 ip address. Now we can check with client web browser to VIP ip address that load balancer is actually works. in the web browser we open to VIP 172.16.10.10 ip addres. Member port and monitor port are miss configured hence health check failed. Member in WARNING state should be treated as DOWN. error Show loadbalancer Latest Errors information. monitor Show loadbalancer HealthMonitor information. 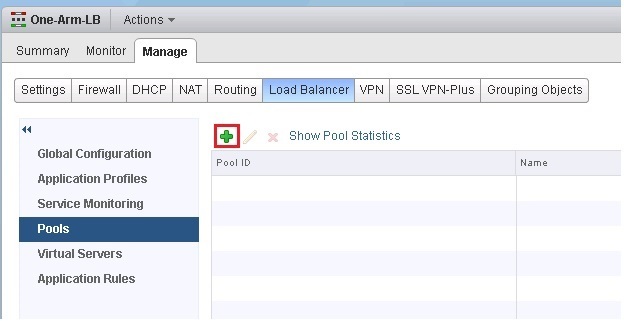 pool Show loadbalancer pool information. session Show loadbalancer Session information. table Show loadbalancer Sticky-Table information. 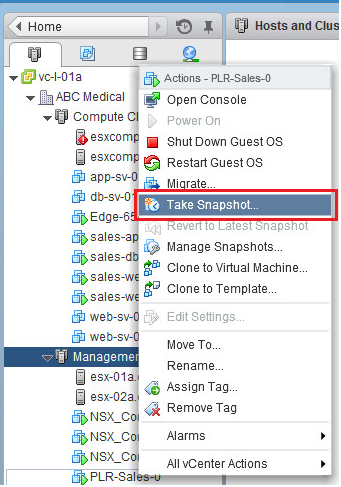 virtual Show loadbalancer virtualserver information. Deployment of multi-tier applications: in some cases, the Web, Application and Database tiers can be deployed as part of the same IP subnet. Web and Application tiers are typically leveraging virtual workloads, but that is not the case for the Database tier where bare-metal servers are commonly deployed. As a consequence, it may then be required to establish intra-subnet (intra-L2 domain) communication between the Application and the Database tiers. Physical to virtual (P-to-V) migration: many customers are virtualizing applications running on bare metal servers and during this P-to-V migration it is required to support a mix of virtual and physical nodes on the same IP subnet. Leveraging external physical devices as default gateway: in such scenarios, a physical network device may be deployed to function as default gateway for the virtual workloads connected to a logical switch and a L2 gateway function is required to establish connectivity to that gateway. Deployment of physical appliances (firewalls, load balancers, etc.). 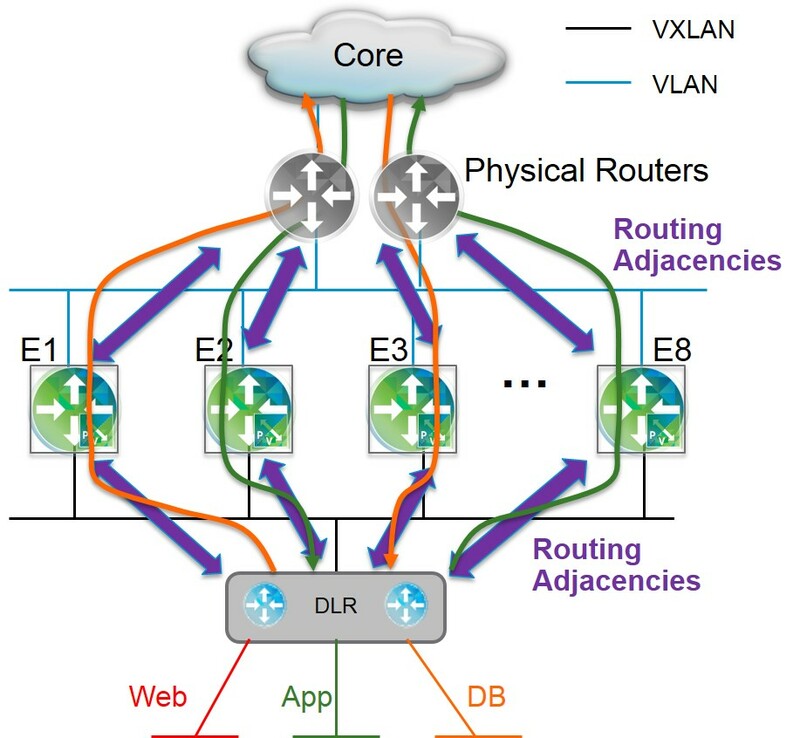 To fulfill the specific requirements listed above, it is possible to deploy devices performing a “bridging” functionality that enables communication between the “virtual world” (logical switches) and the “physical world” (non virtualized workloads and network devices connected to traditional VLANs). NSX offers this functionality in software through the deployment of NSX L2 Bridging allowing VMs to be connected at layer 2 to a physical network (VXLAN to VLAN ID mapping), even if the hypervisor running the VM is not physically connected to that L2 physical network. Figure above shows an example of L2 bridging, where a VM connected in logical space to the VXLAN segment 5001 needs to communicate with a physical device deployed in the same IP subnet but connected to a physical network infrastructure (in VLAN 100). 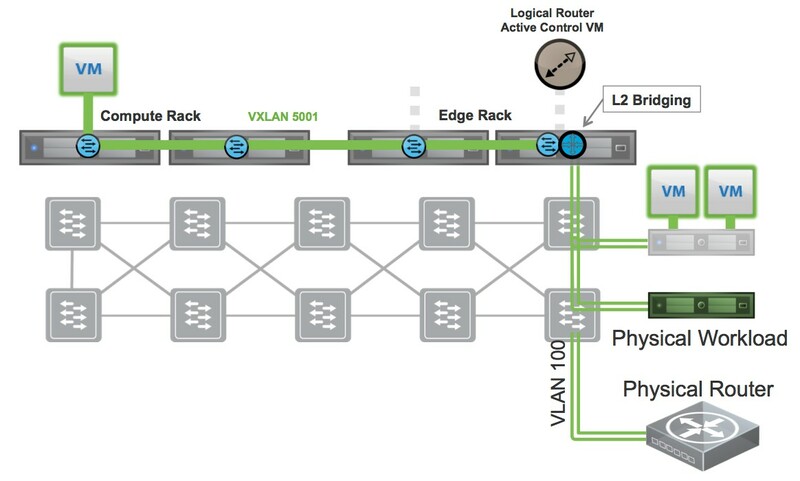 In the current NSX-v implementation, the VXLAN-VLAN bridging configuration is part of the distributed router configuration; the specific ESXi hosts performing the L2 bridging functionality is hence the one where the control VM for that distributed router is running. In case of failure of that ESXi host, the ESXi hosting the standby Control VM (which gets activated once it detects the failure of the Active one) would take the L2 bridging function. The VXLAN-VLAN mapping is always performed in 1:1 fashion. 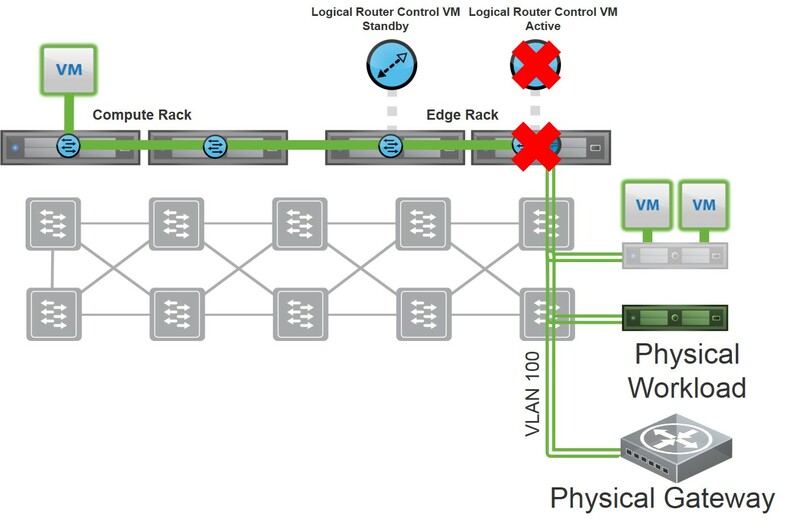 This means traffic for a given VXLAN can only be bridged to a specific VLAN, and vice versa. 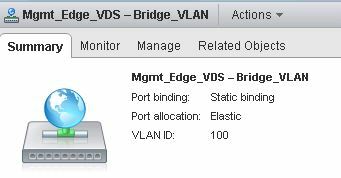 A given bridge instance (for a specific VXLAN-VLAN pair) is always active only on a specific ESXi host. 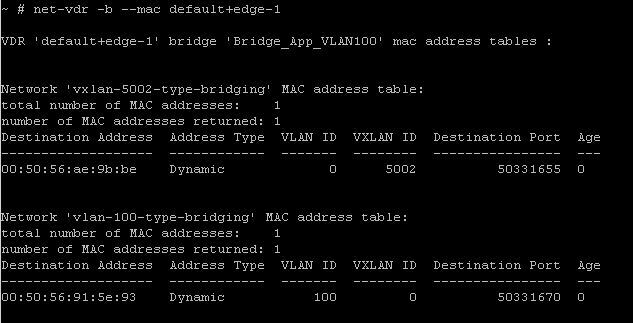 However, through configuration it is possible to create multiple bridges instances (for different VXLAN-VLAN pairs) and ensure they are spread across separate ESXi hosts. This improves the overall scalability of the L2 bridging function. The NSX Layer 2 bridging data path is entirely performed in the ESXi kernel, and not in user space. Once again, the Control VM is only used to determine the ESXi host where a given bridging instance is active, and not to perform the bridging function. 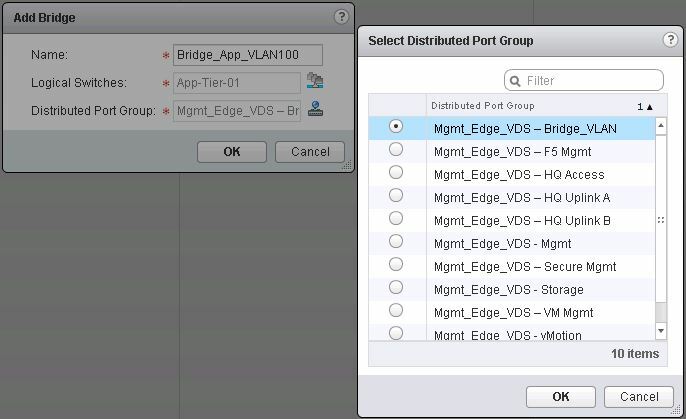 In this scenario we would like to Bridge Between App VM connected to VXLAN 5002 to virtual machine connected to VLAN 100. Now VM on Logical Switch App-Tier-01 can communicate with Physical or virtual machine on VLAN 100. 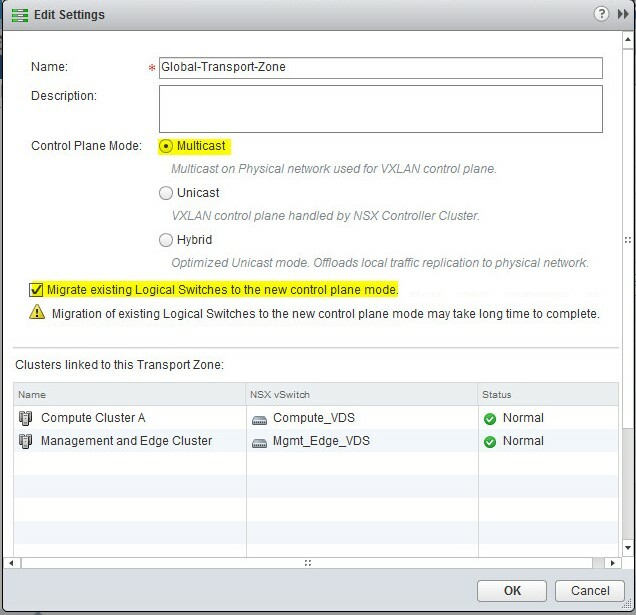 Currently in NSX-V 6.1 We can’t enable routing on the VXLAN logical switch that is bridged to a VLAN. So How VM in VXLAN 5002 can communicate with VXLAN 5001 ? We need to know where is the Active DLR Control VM is located(if we have HA). Inside this esxi host the Bridging happen in kernel space. Now we know that “default+edge-1” is the VDR name. After connect VM to Logical Switch App-Tier-01 and ping VM in VLAN 100. One of the most challenging problems in managing large networks is the complexity of security administration. 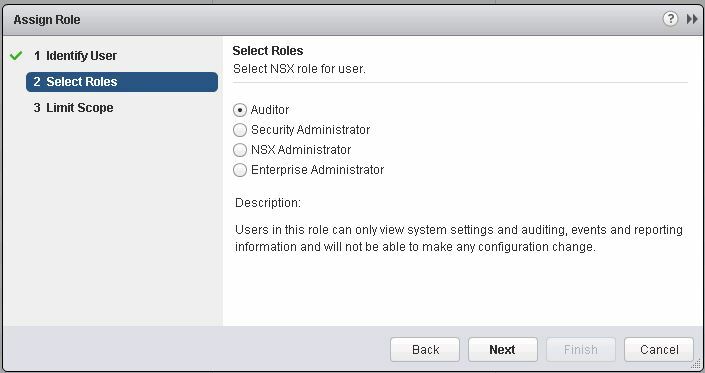 Within NSX we have four built in roles, We can map User or Group to one of the NSX Role. but i think Instead of assigning roles to individual users the preferred way is to assigning role to group. 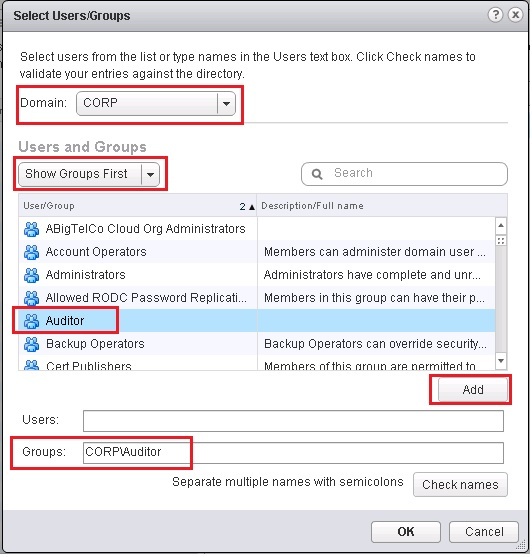 Organizations create user groups for proper user management. 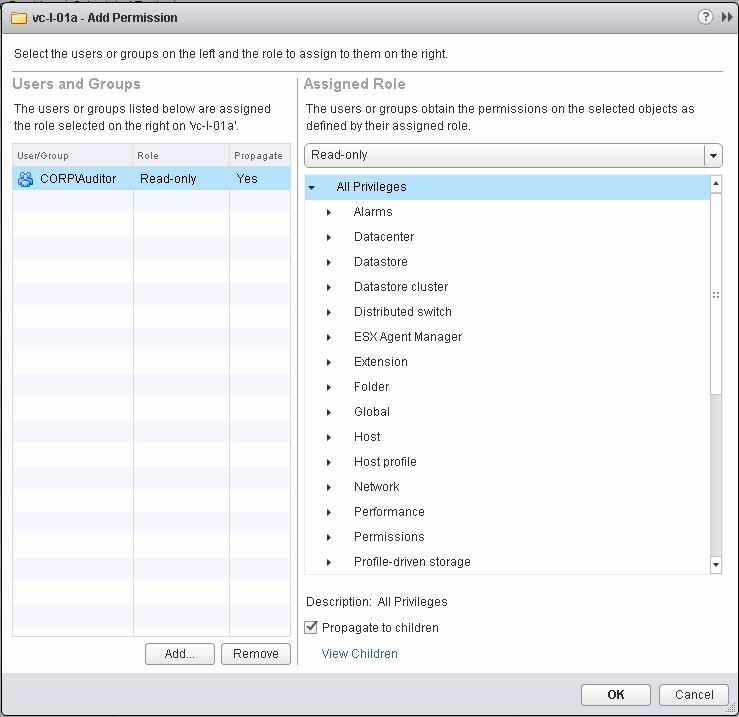 After integration with SSO, NSX Manager can get the details of groups to which a user belongs to. Within NSX Manager we have four pre built RBAC roles cover different nsx permission and area in NSX environment. 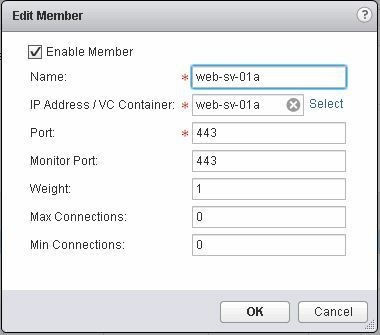 Whenever we want to assign role on NSX, we can assign role to SSO User or Group. 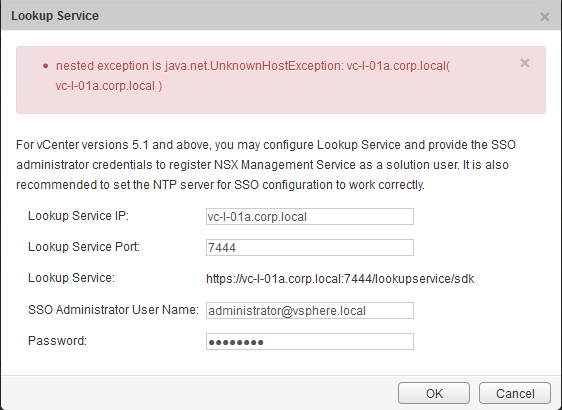 When Lookup service is not configured then the group based role assignment would not work i.e the user from that group would not be able to login to NSX. The reason is we cannot fetch any group information from the SSO server. The group based authentication provider is only available when Lookup service is configured. 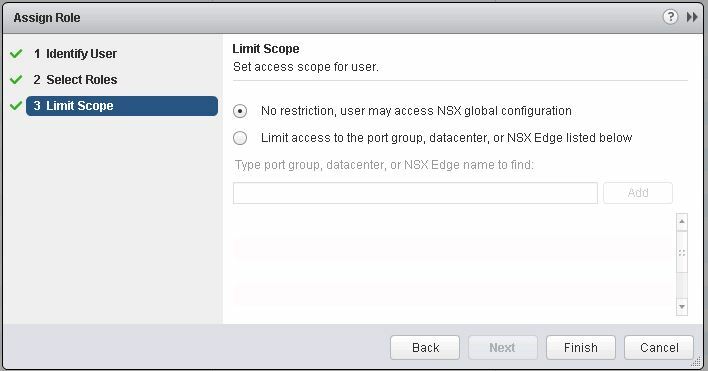 User login where the user is explicitly assigned role on NSX will not be affected. This means that the customer has to individually assign roles to the users and would not be able to take advantage of SSO groups. For NSX, vCenter SSO server is one of the identity provider for authentication. For authentication on NSX, prerequisite is that the user / group has to be assigned role on NSX. 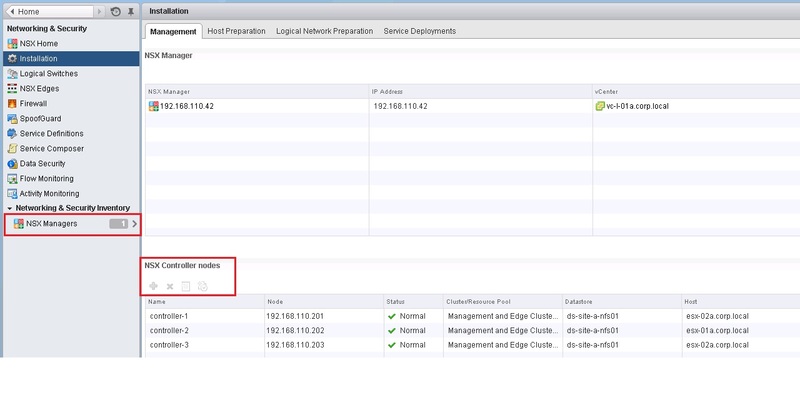 Note: NTP/DNS must configure on the NSX Manager for lookup service to work. Auditor, Security Administrator, NSX Administrator, Enterprise Administrator. 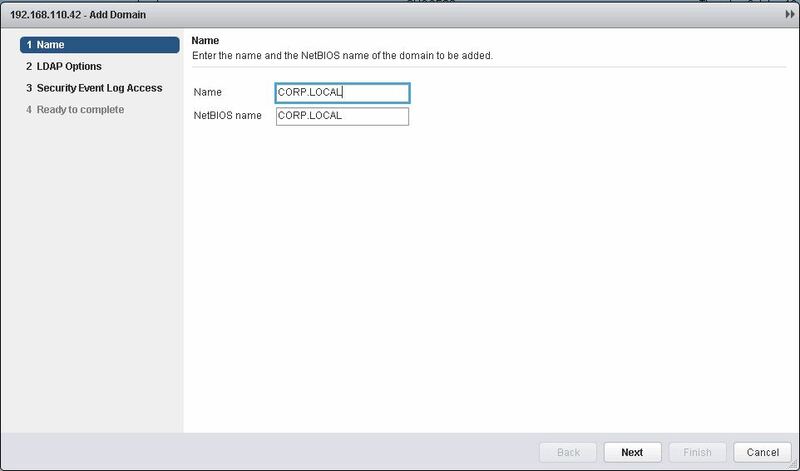 Connect Directory Domain to NSX Manager. Click on next. 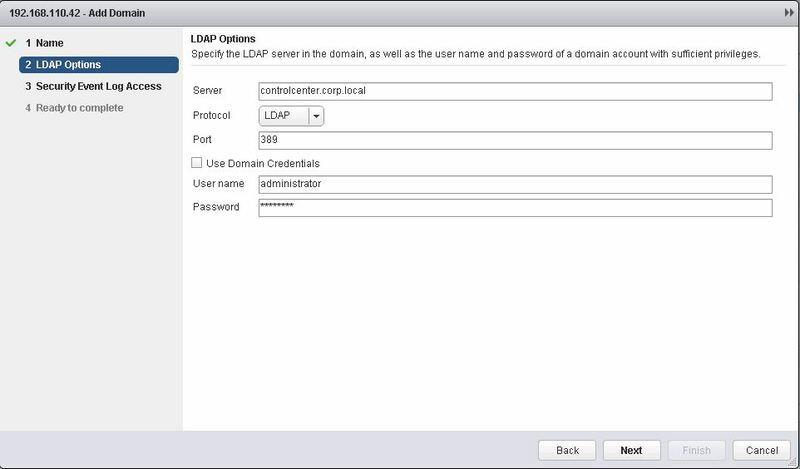 NSX Manager will try to connect to LDAP (i,e AD) server using the above info. If result is successful, screenshot on next page will appear. NSX used this information to improve user identity firewall rules. Now we can map Active Directory groups to pre-built NSX Manager roles. 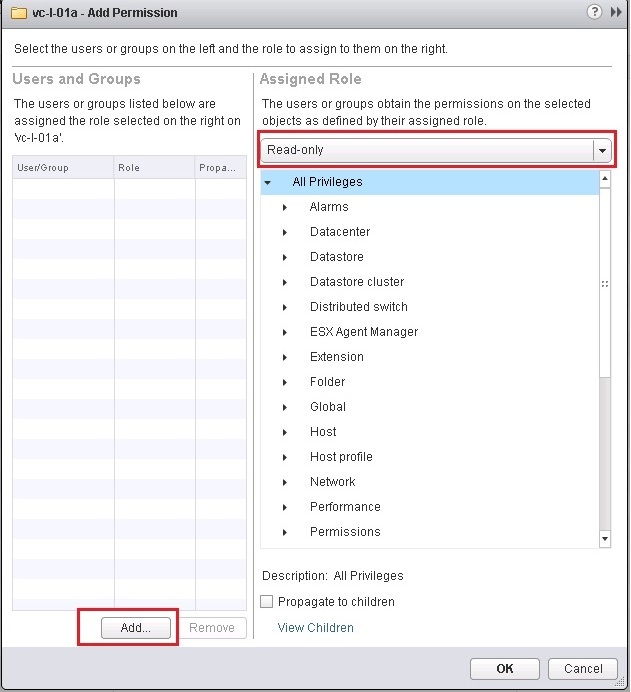 Here we can select if we want to map specific A/D user to NSX Role or A/D Group to Role. The login successfull but where is the “Network & Security” tab gone ? 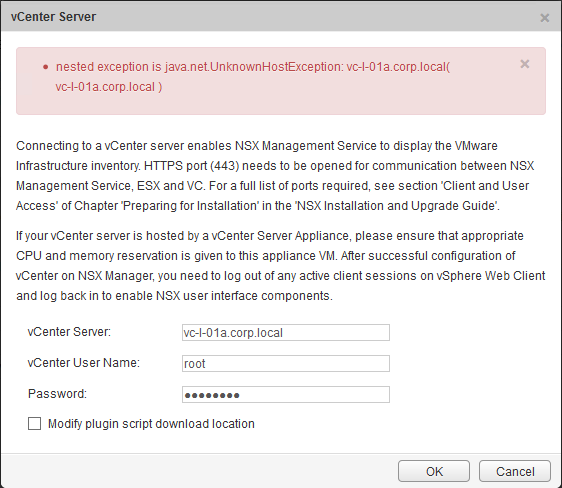 So far we configure all NSX Manager part but we didnt take care of the vCenter Configuration permission for that group. are you confusing ? 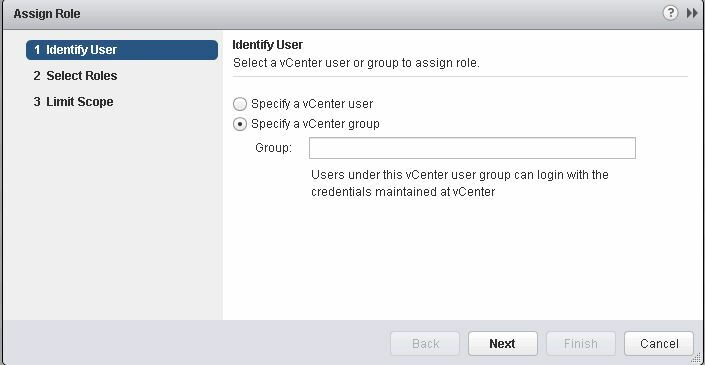 vCenter has is own Role for each group. we need to configure roles to etch A/D group we configured. These settings determine what the user can make the in vCenter environment. Let’s start by configure the Auditor Role for Auditor A/D group. we know this group is for “Read Only” in the NSX Manager, so it will make sense to give this group “Read Only” to all other vCenter environment. For Auditor Role “Read Only” is the Minimum. What if the user member of two A/D Group ? The user will gain combined permission access of both of the groups. 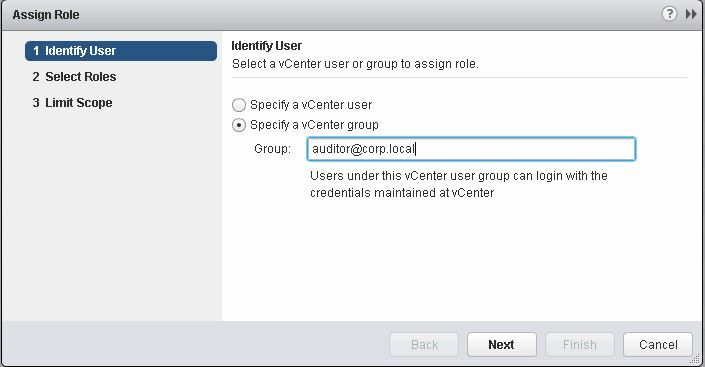 For example: the user memberof “Auditor” group and “NSX Security”, the results will be user will have read only permission on all nsx infrastructure and also gain access to all security related area in NSX. 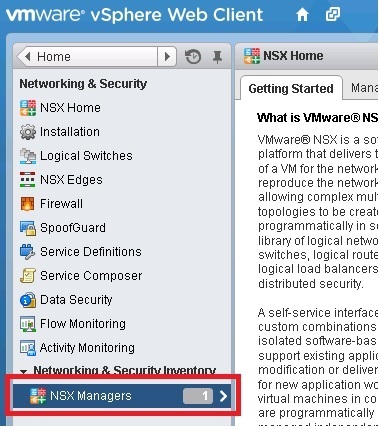 In this post we demonstrate the NSX manager different roles. We configure Microsoft Active Directory as External database source for user’s identity. The modern data center design is changing, following a shift in the habits of consumers using mobile devices, the number of new applications that appear every day and the rate of end-user browsing which has grown exponentially. Planning a new data center requires meeting certain fundamental design guidelines. The principal goals in data center design are: Scalability, Redundancy and High-bandwidth. In this blog we will describe the Equal Cost Multi-Path functionality (ECMP) introduced in VMware NSX release 6.1 and discuss how it addresses the requirements of scalability, redundancy and high bandwidth. ECMP has the potential to offer substantial increases in bandwidth by load-balancing traffic over multiple paths as well as providing fault tolerance for failed paths. This is a feature which is available on physical networks but we are now introducing this capability for virtual networking as well. ECMP uses a dynamic routing protocol to learn the next-hop towards a final destination and to converge in case of failures. 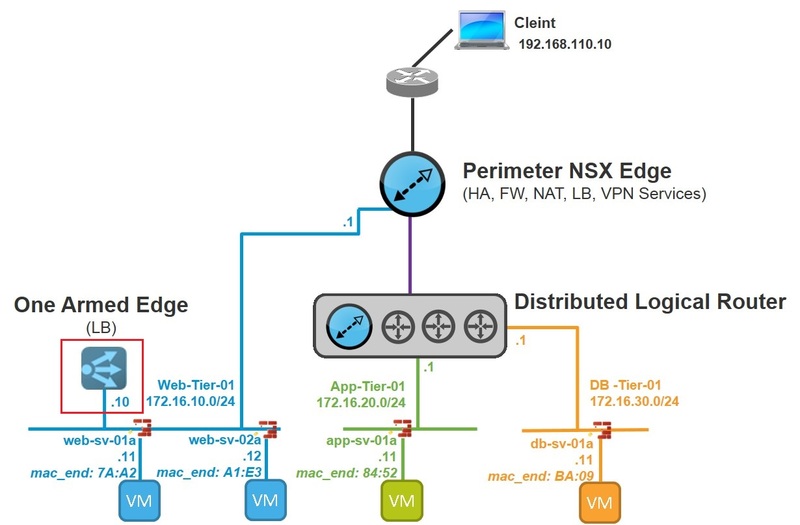 For a great demo of how this works, you can start by watching this video, which walks you through these capabilities in VMware NSX. To keep pace with the growing demand for bandwidth, the data center must meet scale out requirements, which provide the capability for a business or technology to accept increased volume without redesign of the overall infrastructure. The ultimate goal is avoiding the “rip and replace” of the existing physical infrastructure in order to keep up with the growing demands of the applications. Data centers running business critical applications need to achieve near 100 percent uptime. In order to achieve this goal, we need the ability to quickly recover from failures affecting the main core components. Recovery from catastrophic events needs to be transparent to end user experiences. 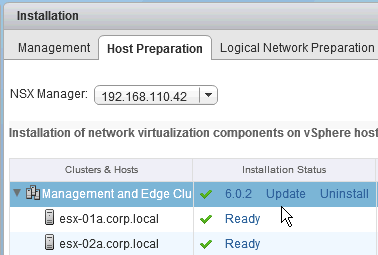 ECMP with VMware NSX 6.1 allows you to use upto a maximum of 8 ECMP Paths simultaneously. 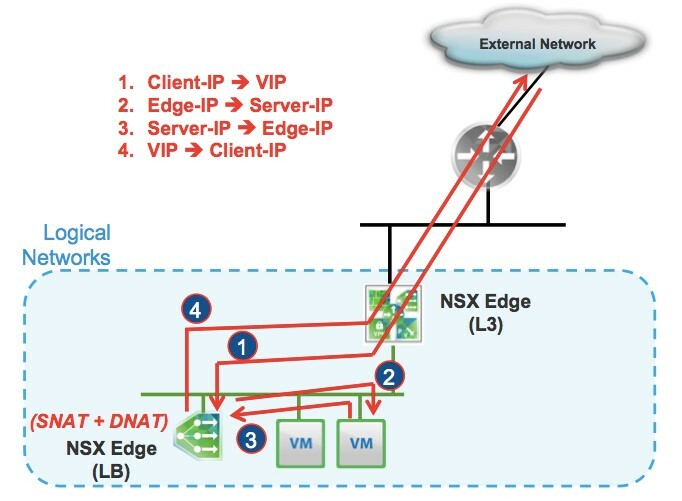 In a specific VMware NSX deployment, those scalability and resilience improvements are applied to the “on-ramp/off-ramp” routing function offered by the Edge Services Gateway (ESG) functional component, which allows communication between the logical networks and the external physical infrastructure. External user’s traffic arriving from the physical core routers can use up to 8 different paths (E1-E8) to reach the virtual servers (Web, App, DB). In the same way, traffic returning from the virtual server’s hit the Distributed Logical Router (DLR), which can choose up to 8 different paths to get to the core network. When a traffic flow needs to be routed, the round robin algorithm is used to pick up one of the links as the path for all traffic of this flow. The algorithm ensures to keep in order all the packets related to this flow by sending them through the same path. Once the next-hop is selected for a particular Source IP and Destination IP pair, the route cache stores this. Once a path has been chosen, all packets related to this flow will follow the same path. There is a default IPv4 route cache timeout, which is 300 seconds. If an entry is inactive for this period of time, it is then eligible to be removed from route cache. Note that these settings can be tuned for your environment. The DLR will choose a path based on a Hashing algorithm of Source IP and Destination IP. What happens in case of a failure on one of Edge Devices? OSPF will send hello messages between neighbors, the OSPF “Hello” protocol is used and determines the Interval as to how often an OSPF Hello is sent. Another OSPF timer called “Dead” Interval is used, which is how long to wait before we consider an OSPF neighbor as “down”. The OSPF Dead Interval is the main factor that influences the convergence time. Dead Interval is usually 4 times the Hello Interval but the OSPF (and BGP) timers can be set as low as 1 second (for Hello interval) and 3 seconds (for Dead interval) to speed up the traffic recovery. In the example above, the E1 NSX Edge has a failure; the physical routers and DLR detect E1 as Dead at the expiration of the Dead timer and remove their OSPF neighborship with him. As a consequence, the DLR and the physical router remove the routing table entries that originally pointed to the specific next-hop IP address of the failed ESG. As a result, all corresponding flows on the affected path are re-hashed through the remaining active units. It’s important to emphasize that network traffic that was forwarded across the non-affected paths remains unaffected. With ECMP it’s important to have introspection and visibility tools in order to troubleshoot optional point of failure. Let’s look at the following topology. A user outside our Data Center would like to access the Web Server service inside the Data Center. The user IP address is 192.168.100.86 and the web server IP address is 172.16.10.10. This User traffic will hit the Physical Router (R1), which has established OSPF adjacencies with E1 and E2 (the Edge devices). As a result R1 will learn how to get to the Web server from both E1 and E2 and will get two different active paths towards 172.16.10.10. R1 will pick one of the paths to forward the traffic to reach the Web server and will advertise the user network subnet 192.168.100.0/24 to both E1 and E2 with OSPF. 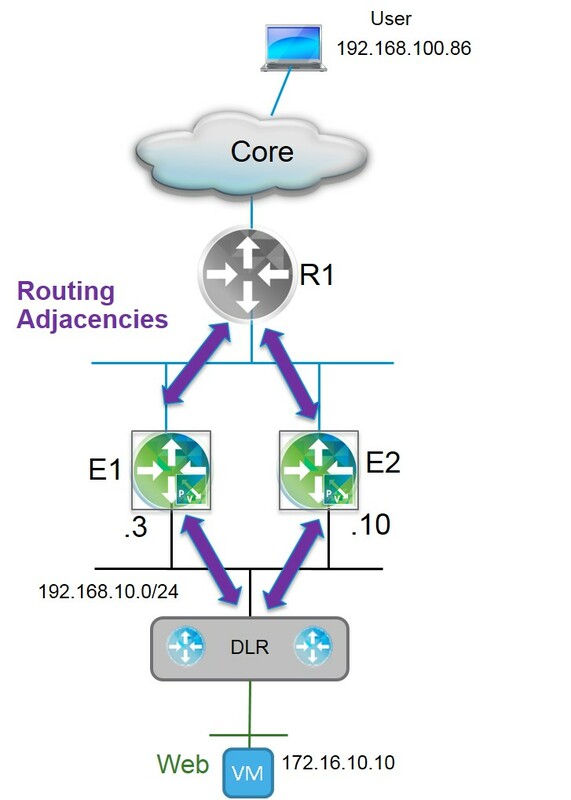 E1 and E2 are NSX for vSphere Edge devices that also establish OSPF adjacencies with the DLR. E1 and E2 will learn how to get to the Web server via OSPF control plane communication with the DLR. From the DLR perspective, it acts as a default gateway for the Web server. This DLR will form an OSPF adjacency with E1 and E2 and have 2 different OSPF routes to reach the user network. From the DLR we can verify OSPF adjacency with E1, E2. From this output we can see that the DLR has two Edge neighbors: 198.168.100.3 and 192.168.100.10.The next step will be to verify that ECMP is actually working. The output from this command shows that the DLR learned the user network 192.168.100.0/24 via two different paths, one via E1 = 192.168.10.1 and the other via E2 = 192.168.10.10. Now we want to display all the packets which were captured by an NSX for vSphere Edge interface. * Note: When using the command “debug packter display interface” we need to add underscore between the expressions after the interface name. ECMP currently implies stateless behavior. This means that there is no support for stateful services such as the Firewall, Load Balancing or NAT on the NSX Edge Services Gateway. 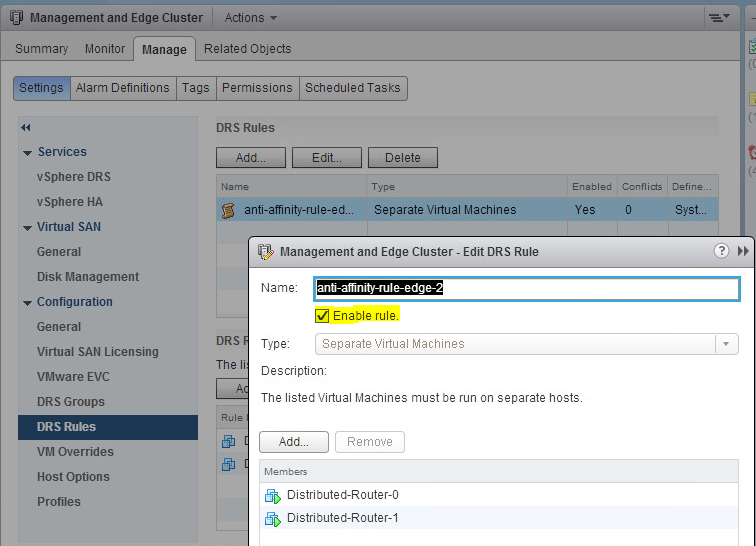 The Edge Firewall gets automatically disabled on ESG when ECMP is enabled. 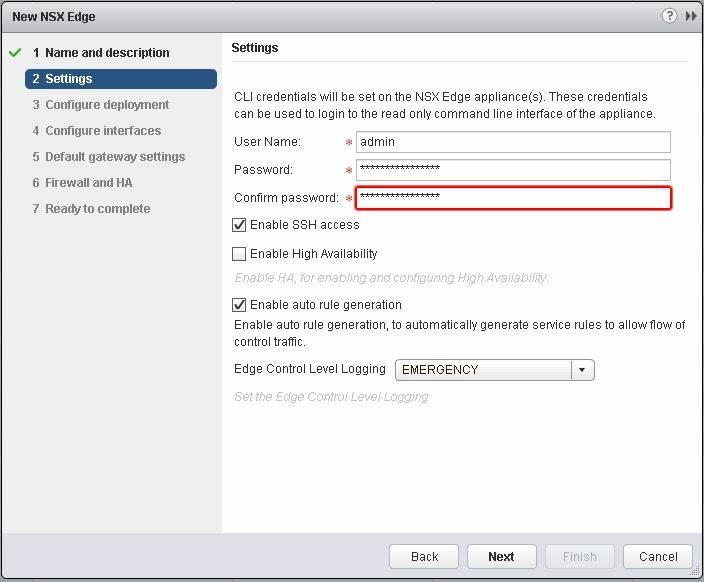 In the current NSX 6.1 release, the Edge Firewall and ECMP cannot be turned on at the same time on NSX edge device. Note however, that the Distributed Firewall (DFW) is unaffected by this. Roie works as a professional services consultant at VMware, focusing on design and implementation of VMware’s software-defined data center products. Roie has more than 12 years in data center architecture, with a focus on network and security solutions for global enterprises. An enthusiastic M.Sc. graduate, Roie holds a wide range of industry leading certifications including Cisco CCIE x2 # 22755 (Data Center, CCIE Security), Juniper Networks JNCIE – Service Provider #849, and VMware vExpert 2014, VCP-NV, VCP-DCV. Max Ardica is a senior technical product manager in VMware’s networking and security business unit (NSBU). Certified as VCDX #171, his primary task is helping to drive the evolution of the VMware NSX platform, building the VMware NSX architecture and providing validated design guidance for the software-defined data center, specifically focusing on network virtualization. Prior to joining VMware, Max worked for almost 15 years at Cisco, covering different roles, from software development to product management. Max owns also a CCIE certification (#13808).